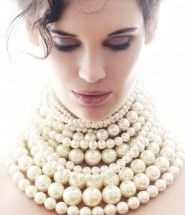 Since 1837, Tiffany & Co. has been the world’s premier jeweler and America’s house of design. 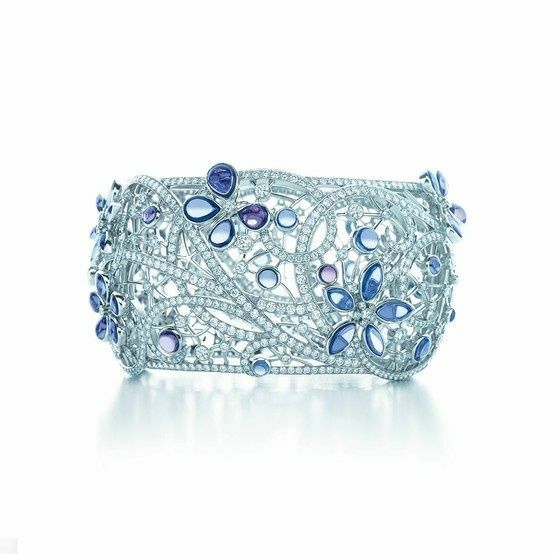 This year in their new Blue Book Collection, the world`s most exquisite gems take center stage in new jewelry couture creations. With the greatest attention to detail, Tiffany craftsmen created masterworks of intricate beauty and uniqueness. 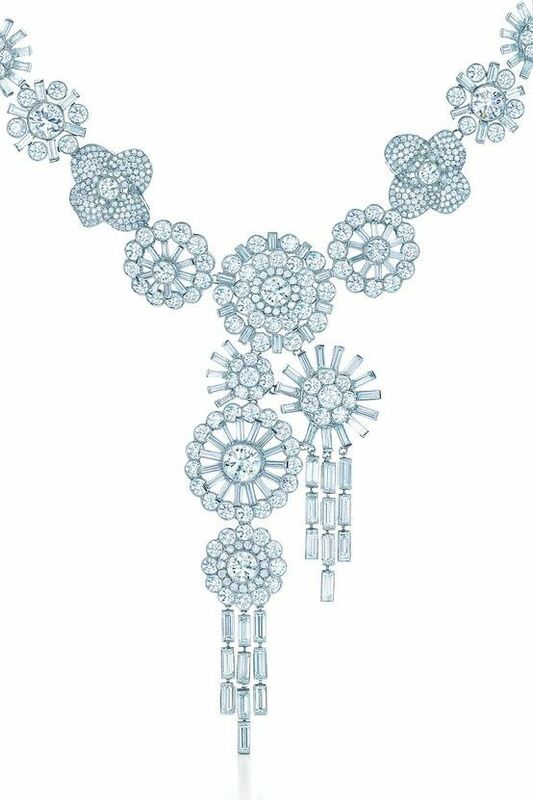 These jewelry pieces were featured in one of the most lavish movies of this year, “The Great Gatsby”. 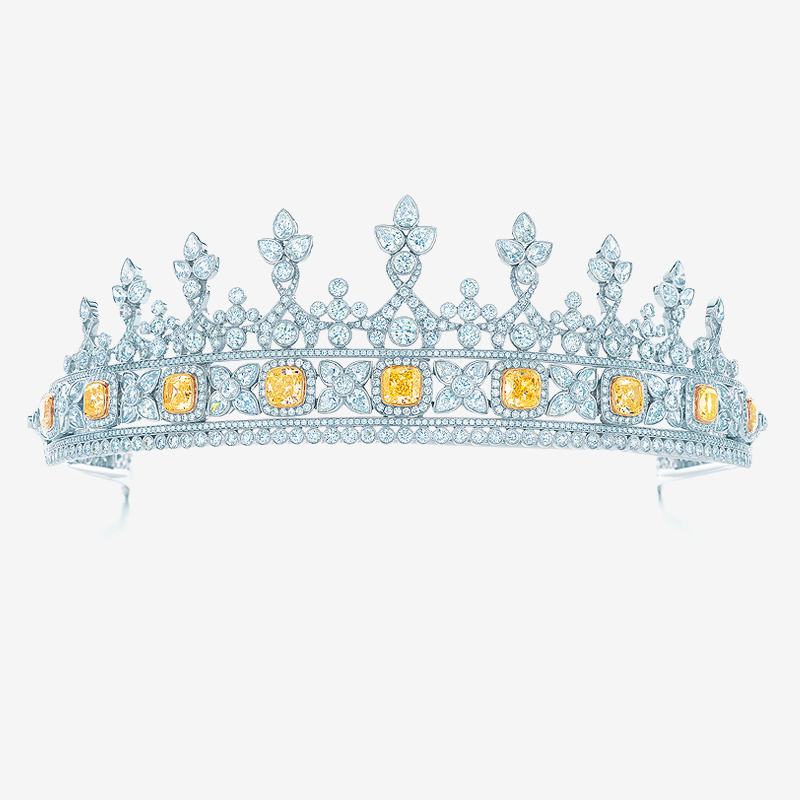 A platinum tiara of white diamonds incorporates a detachable bracelet accented with nine fancy intense Tiffany Yellow Diamonds in 18k gold. 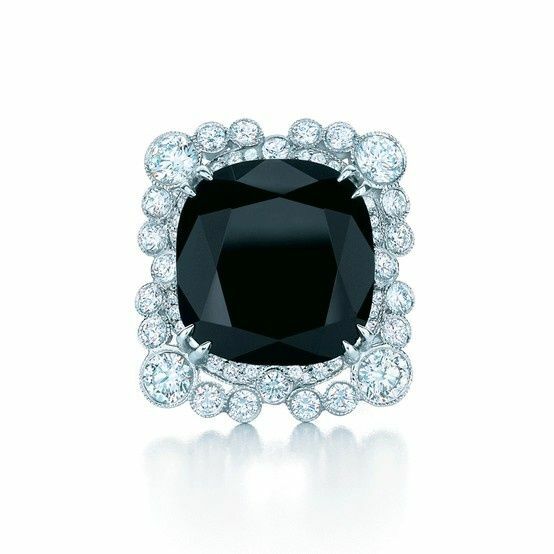 A ring with a cushion-cut black onyx and bezel-set diamonds in platinum that bubble like champagne, from The Great Gatsby Collection. A show of fans unfolds with Art Deco’s strikingly clean lines. 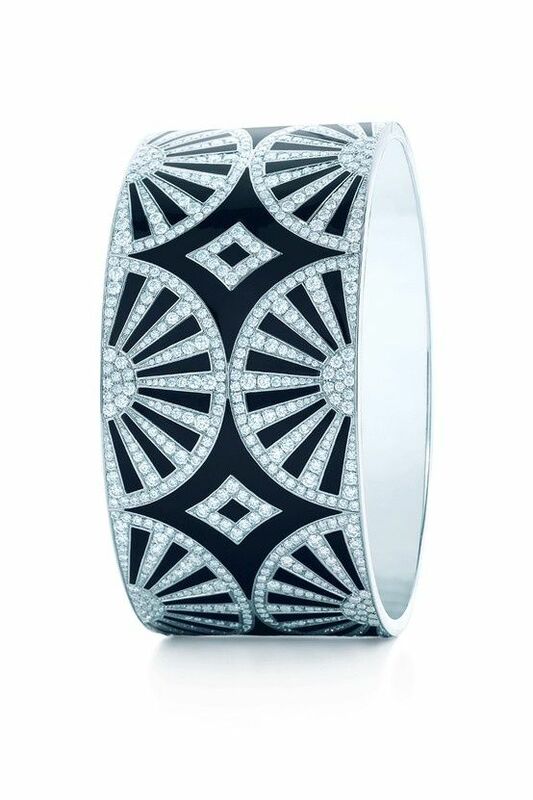 Diamond bangle with black lacquer in platinum. 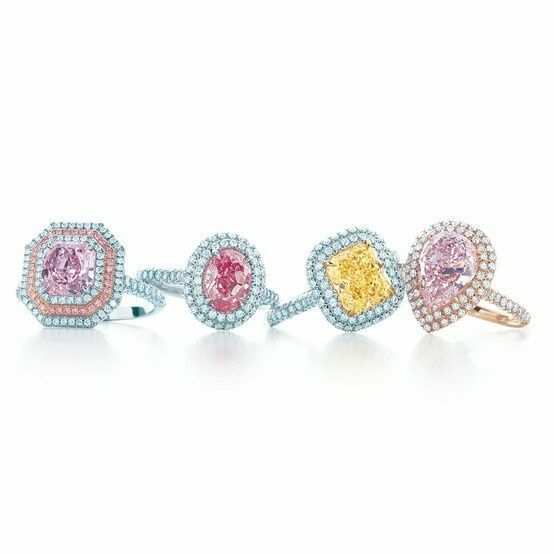 Rings with Tiffany Yellow Diamonds in dynamic combinations with white and pink diamonds, sapphires, spessartites, platinum and 18k gold. 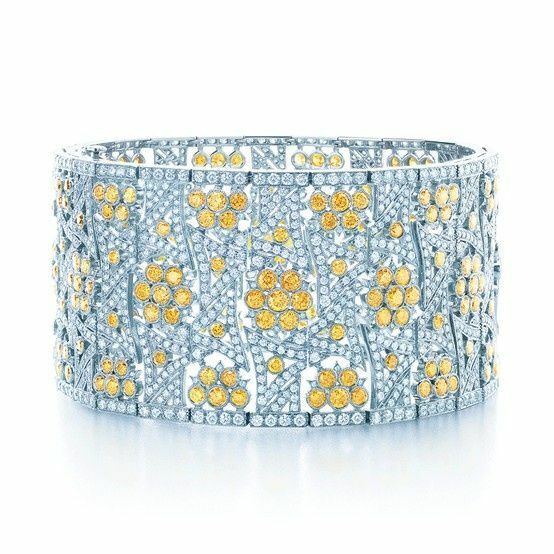 Tiffany Yellow Diamonds inspired a bracelet as radiant as sun-dappled flowers. 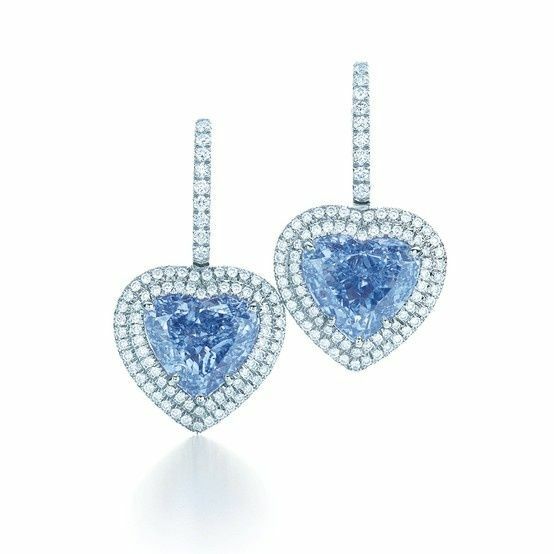 The rare miracle of a matched pair of heart-shaped fancy vivid blue diamonds in earrings with white diamonds and platinum. 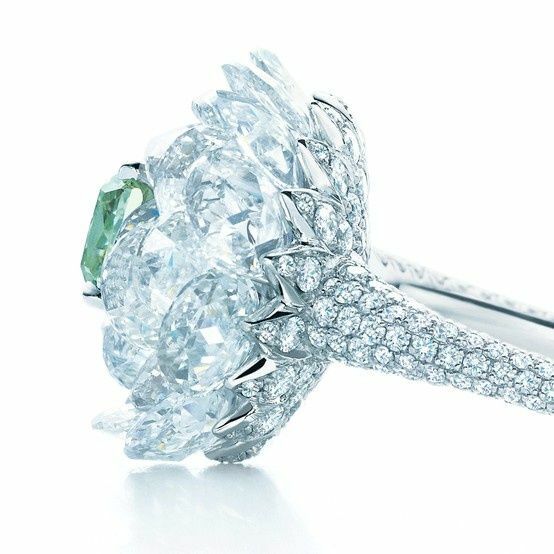 A ring with a fancy vivid green diamond surrounded by rose-cut and round white diamonds. Glamour arrives with the sudden and breathtaking appearance of Tiffany diamonds. 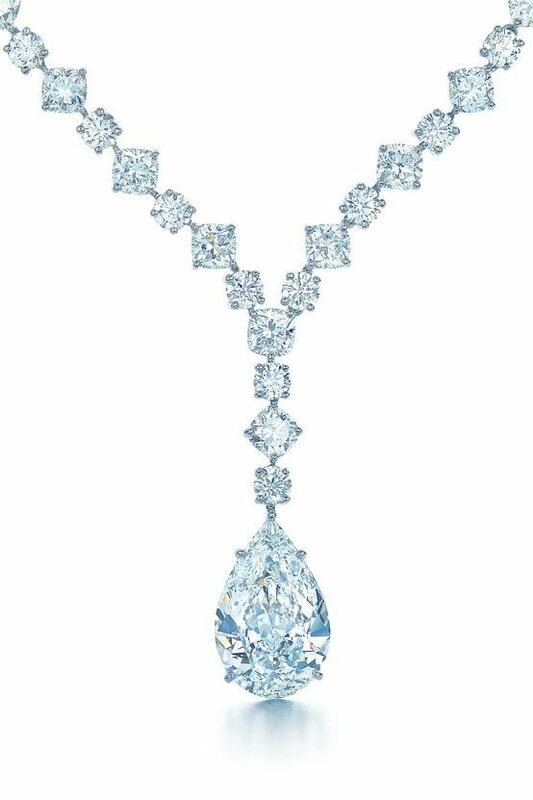 Necklace with a pear-shaped diamond drop in platinum. 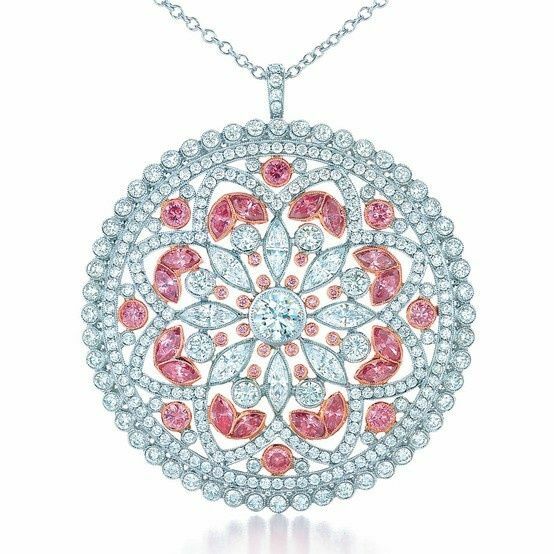 Pink and white diamonds enchant the eye in this pendant. 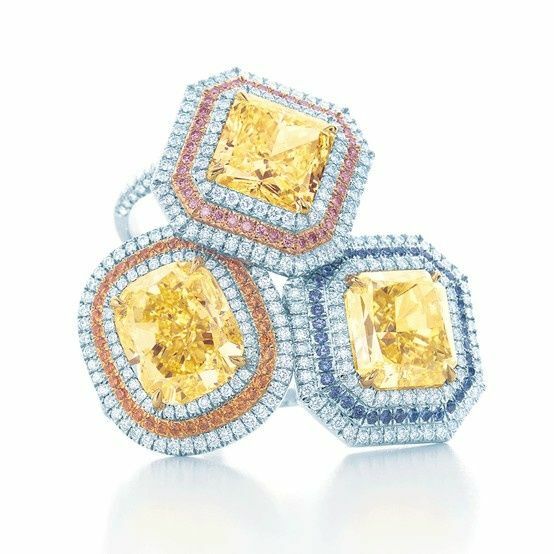 Fancy color diamonds reflect the splendor of nature. To wear these remarkable rings is to experience the most precious diamonds on earth. 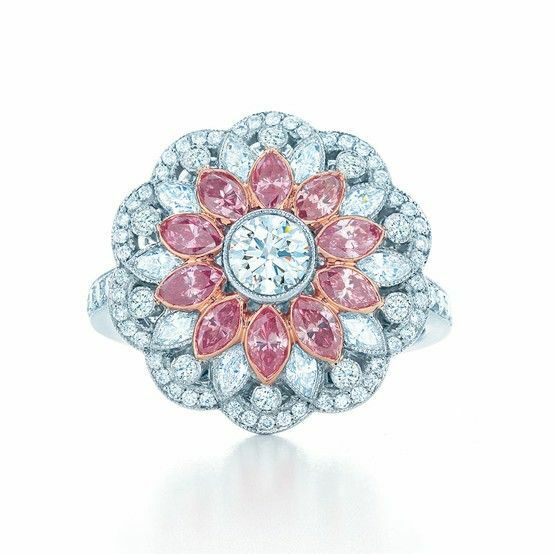 Floral ring with pink and white diamonds in 18k rose gold and platinum. 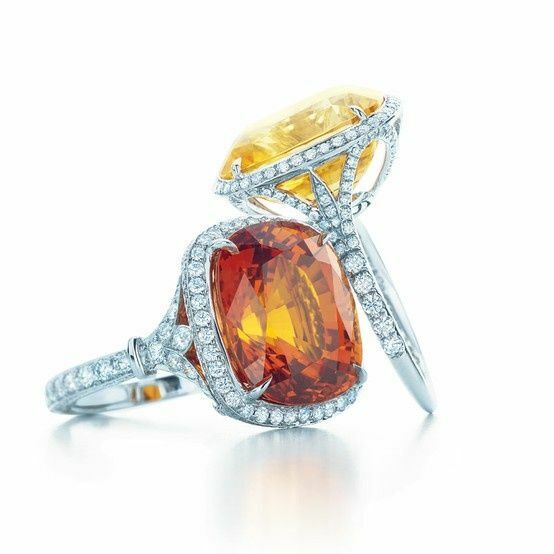 Rings with a 14.32-carat yellow sapphire and a 16.15-carat orange sapphire, both with diamonds in platinum. A rhapsody of stylized blossoms arrays the neckline. Corsage necklace of diamonds in platinum. 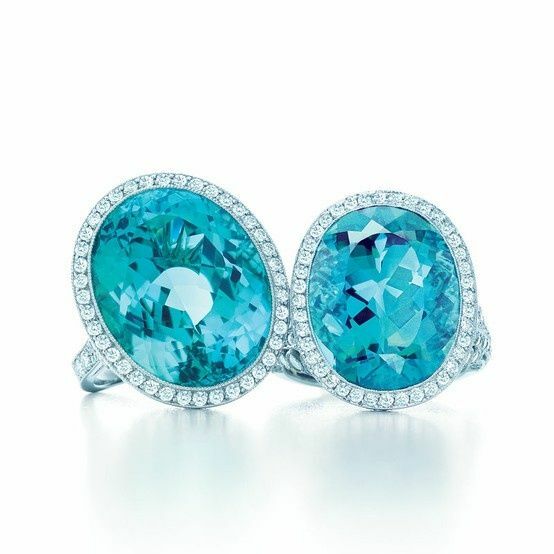 Fashion finds bold new expressions in Tiffany’s brilliant gemstones and settings. Drop earrings with oval spessartites, diamonds and platinum. Color-saturated aquamarines and cascading diamonds shimmer like a waterfall. 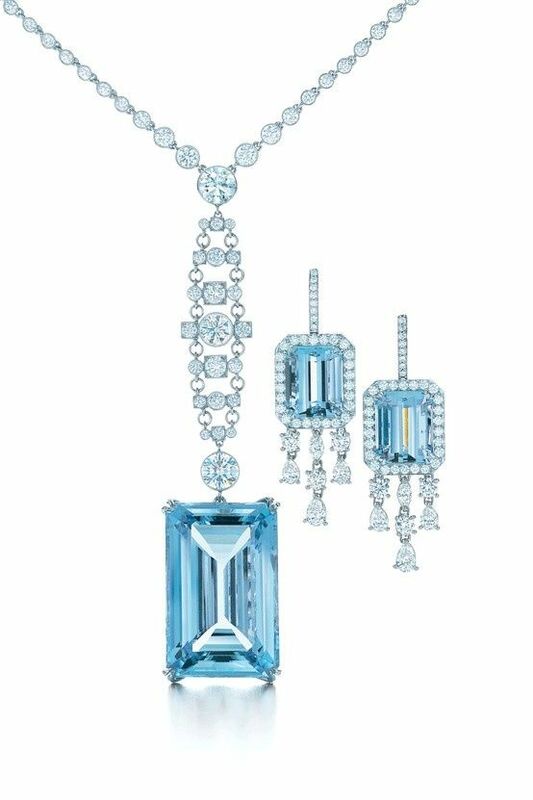 Platinum necklace and earrings from The Great Gatsby Collection. Turquoise of such a deep, even hue and smooth texture is seldom seen. Oval turquoise pendant with diamonds in platinum. 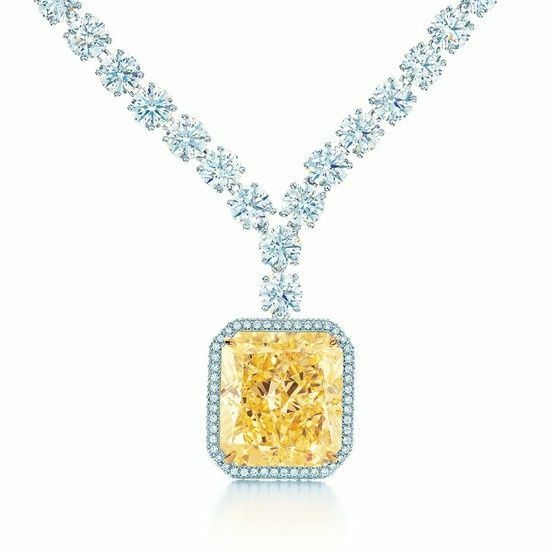 Tiffany Yellow Diamonds unleash an electrifying color and sparkle. Pendant with a 24.82-carat fancy intense Tiffany Yellow Diamond in 18k gold and white diamonds in platinum. 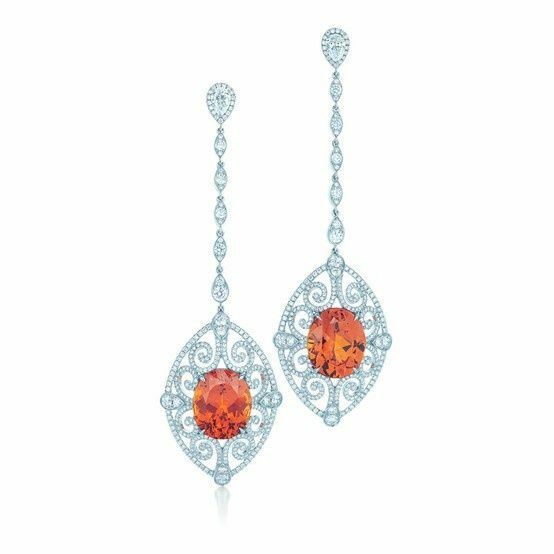 Drop earrings of 20 oval kunzites, diamonds and platinum. Discovered in Madagascar and introduced by Tiffany in 1910, morganite is celebrated for its distinctive pink hue. Pendant with a 40.59-carat morganite and diamonds in platinum. 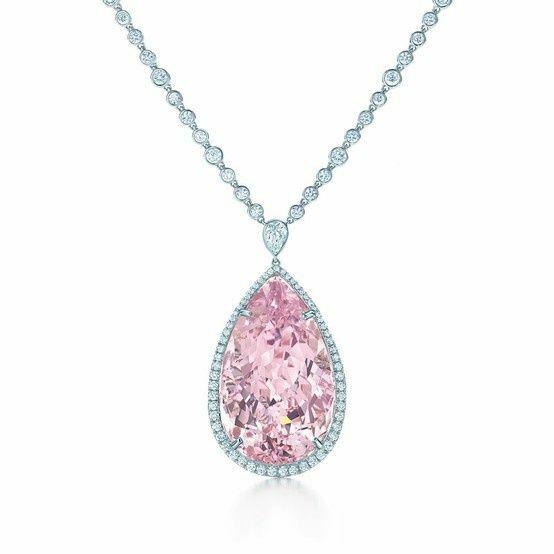 A morganite of such size, quality and color is a rare occurrence, yielded by nature in the fullness of time and elevated by Tiffany in a profusion of diamonds. 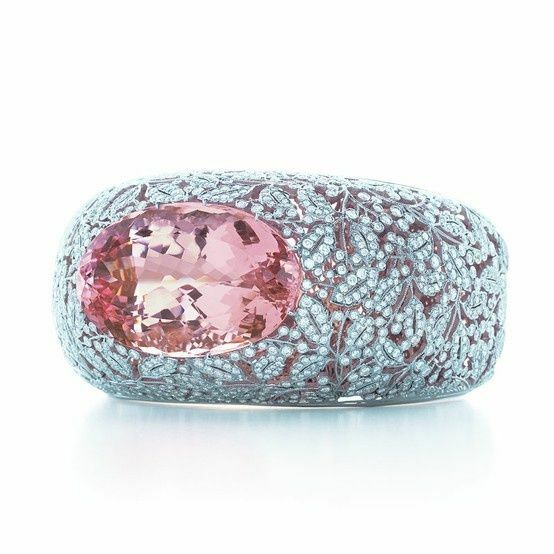 A bangle of platinum with a 74.63-carat morganite and lined with 18k rose gold. The deep blue-green of tourmaline beckons the eye like a tropical sea. Rings of oval green tourmalines, diamonds and platinum. 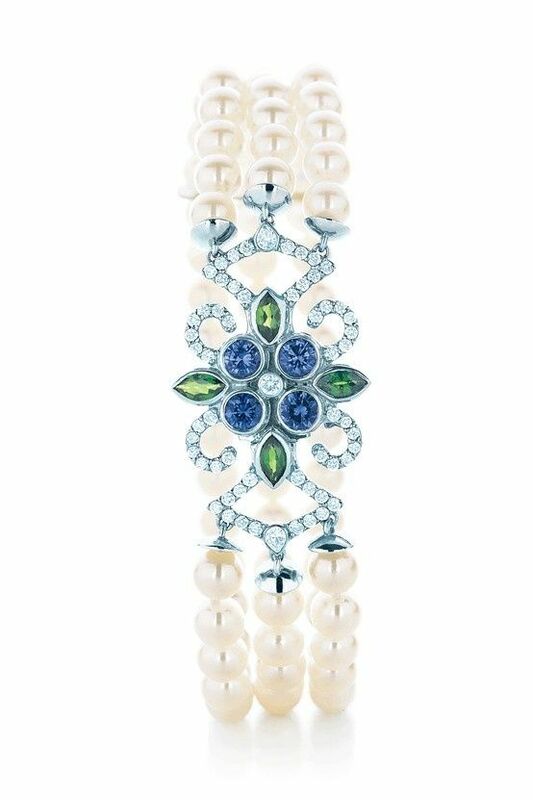 A bracelet of cultured pearls, Montana sapphires, tsavorites and diamonds evokes an endless summer beneath a pristine sky. A butterfly takes wing in elegant form. Brooch with black opals, Montana sapphires and diamonds in platinum. Bracelet of diamonds in platinum with cabochon Montana sapphires set in high relief. 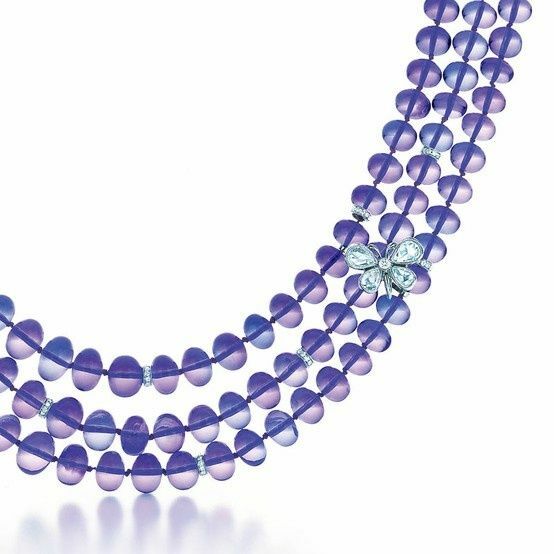 Tanzanite beads drape like vines of translucent berries. 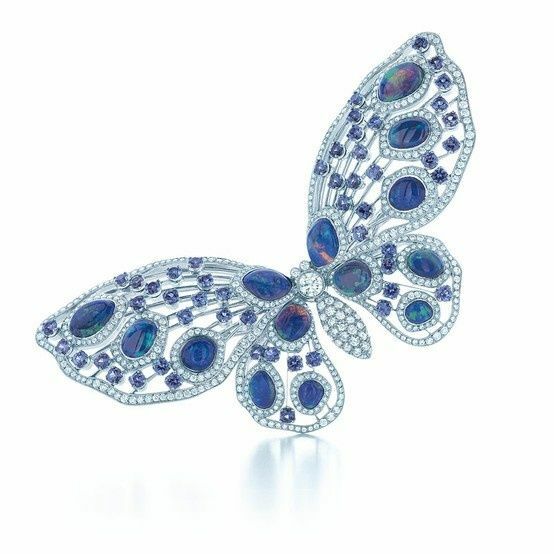 Three strands of tanzanite beads form a necklace and detachable bracelet with butterflies of diamonds set in platinum. 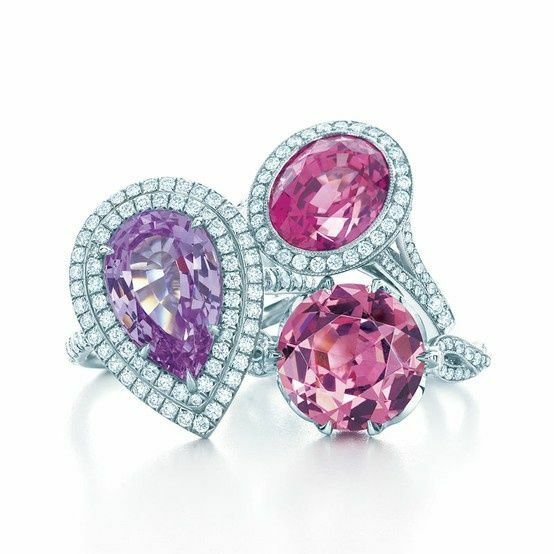 Rings in diamond and platinum settings, clockwise from left: 4.49-carat violet spinel; 5.61-carat pink sapphire; 4.70-carat pink spinel. 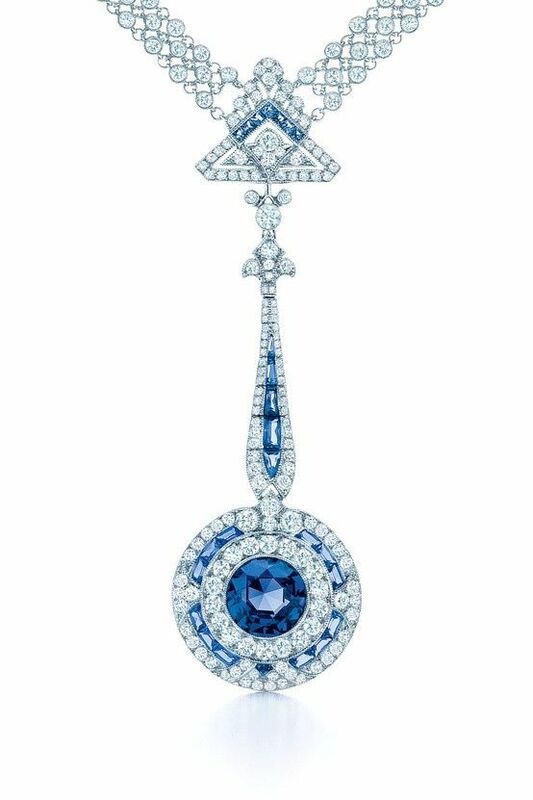 A necklace is set with a rare esteemed Montana sapphire, 5 carats, and embellished with carved Montana sapphires and diamonds in platinum. 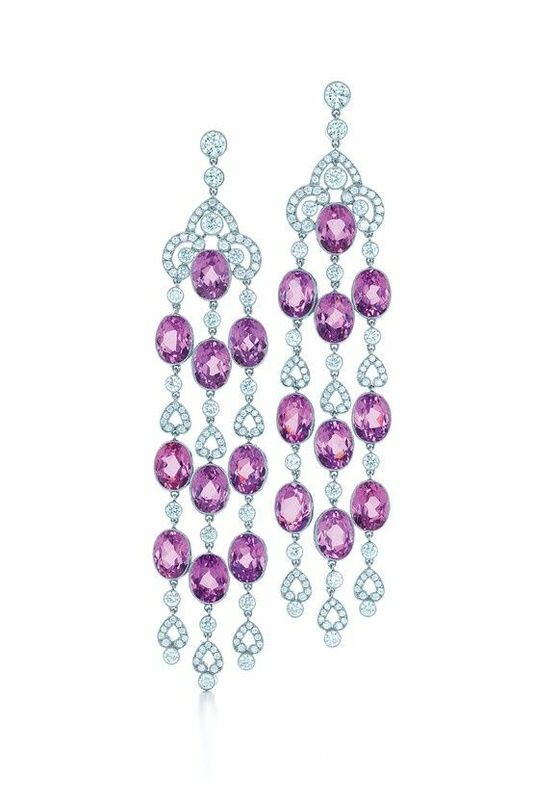 Blue and violet gemstones turn the twilight hour into a celebration of chic. 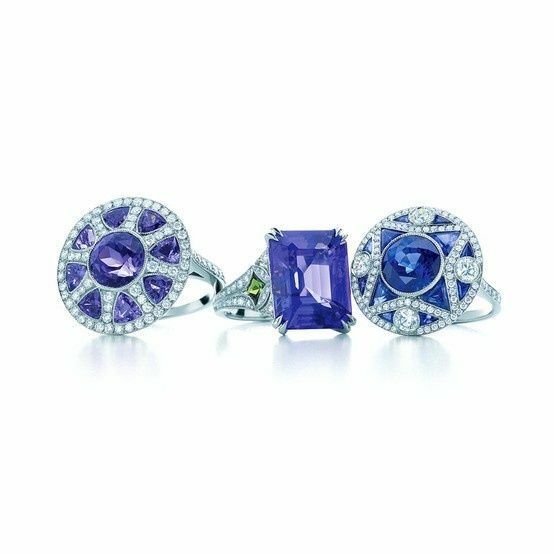 Art Deco-style rings with tanzanites, sapphires and diamonds in platinum from The Great Gatsby Collection. 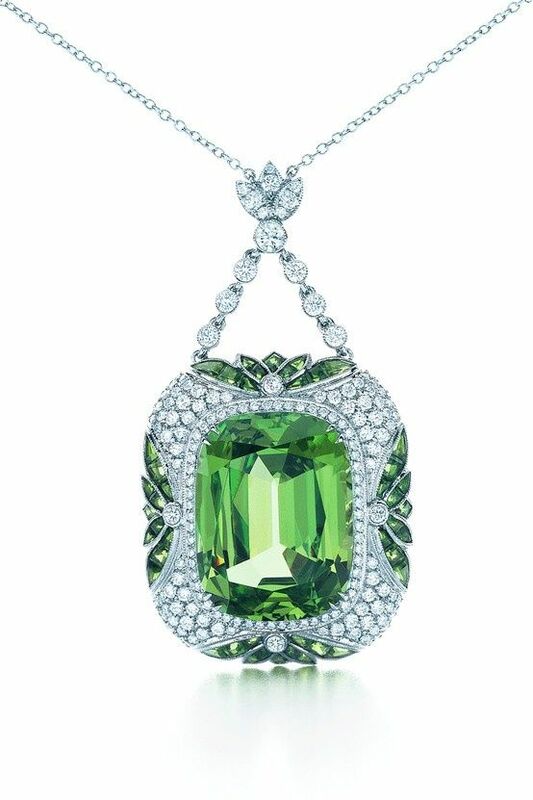 A cushion-cut tsavorite of 20.03 carats is framed in a softly contoured setting with an Art Deco motif of crisp leaves on a diamond and platinum chain. Spring flourishes amid the splendor of a garden court. 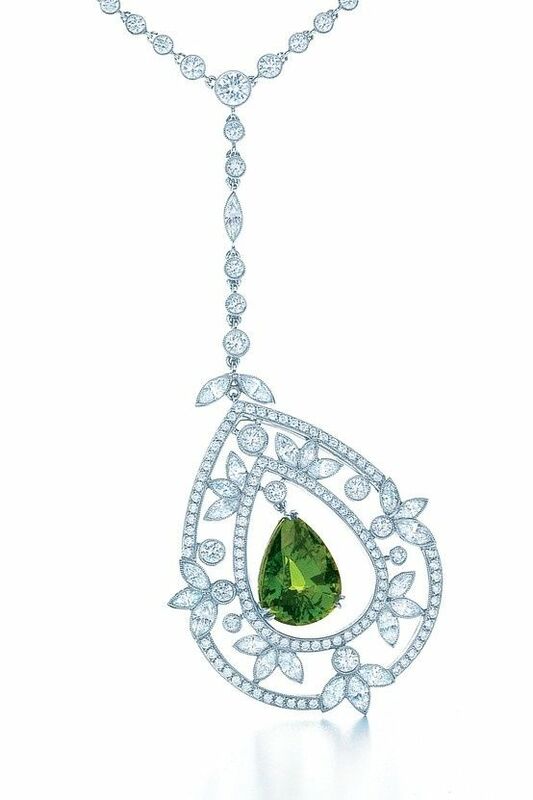 Pendant with a 5.54-carat tsavorite, diamonds and platinum. 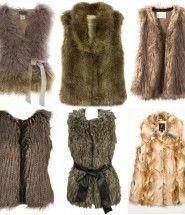 Brilliant variations on evening opulence. 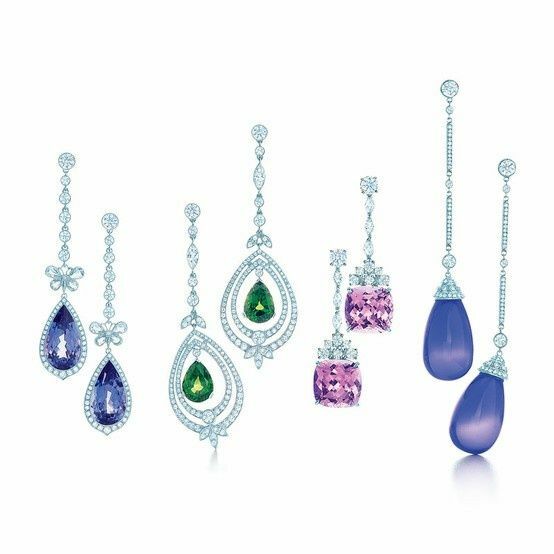 Drop earrings with diamonds and platinum, from left: pear-shaped tanzanites; cushion-cut tsavorites; cushion-cut kunzites; tanzanite drops. Gemstones of scintillating color take their regal place in Tiffany’s design legacy. 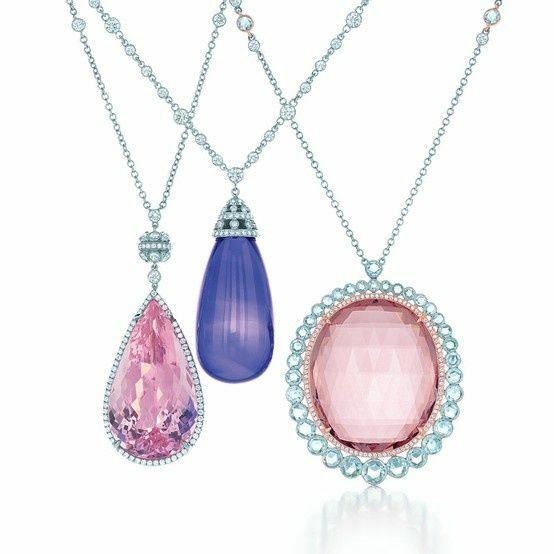 Pendants of morganite and tanzanite with diamonds in platinum. A jazz composition of five gemstones. 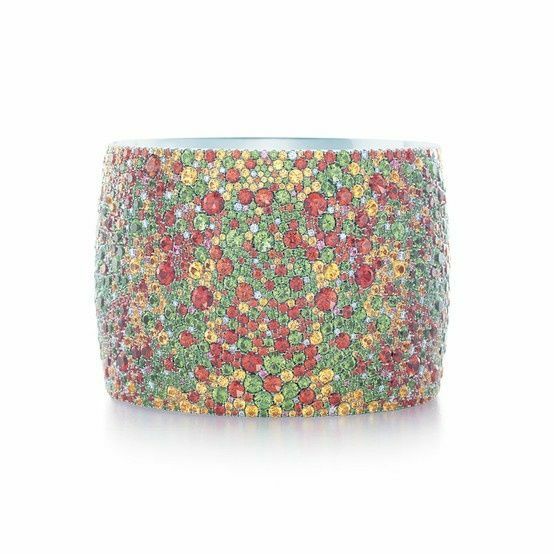 The Seurat bangle with spessartites, tsavorites, yellow sapphires, fancy sapphires and diamonds in 18k white gold. Tiffany artisans skillfully trace the serpent’s sensuous curves with Montana sapphires and diamonds exquisitely set for an ombré effect, with two emerald cabochons. Bracelet of 18k white gold. 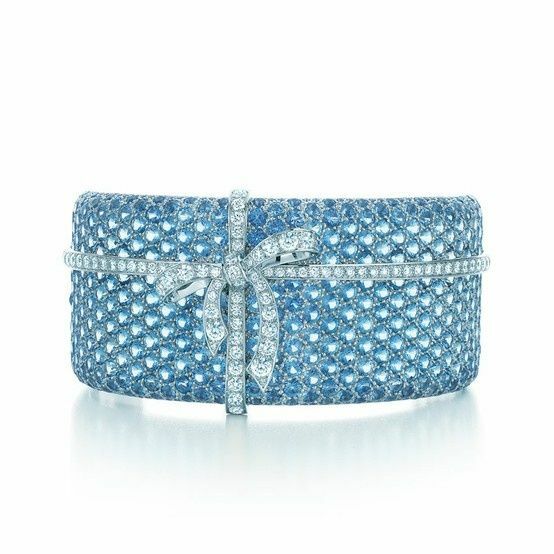 A magnificent bracelet is tied to tradition with sparkling aquamarines and diamonds in platinum. 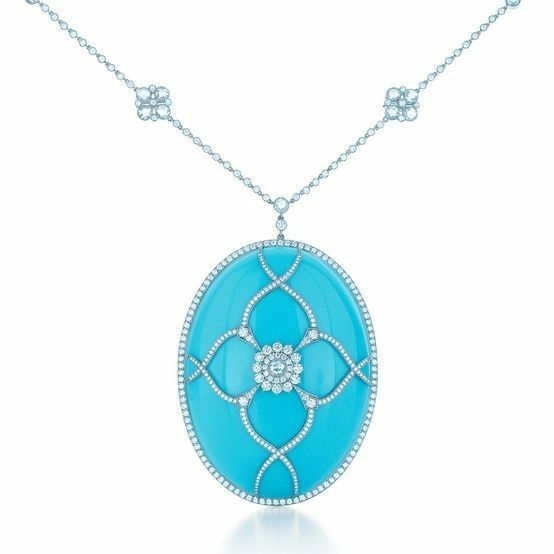 The Tiffany & Co. Schlumberger® Shell Necklace undulates with the motion of the waves. 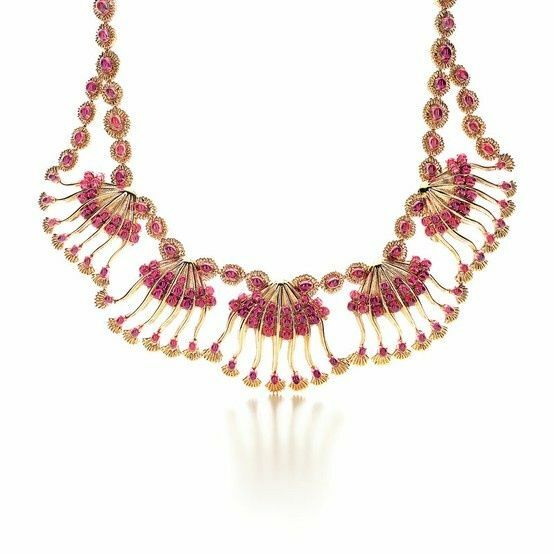 Necklace with 168 cabochon rubellites and 18k gold. 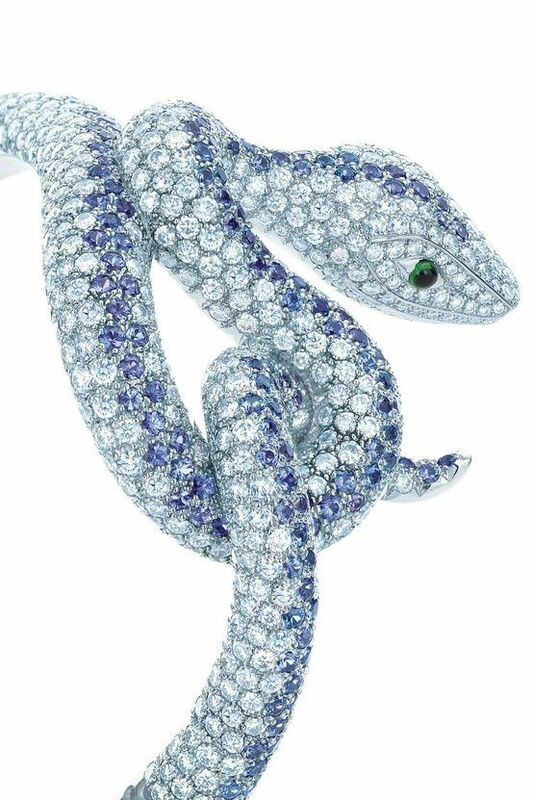 Tiffany gemstones unleashed Jean Schlumberger’s powers of creativity. 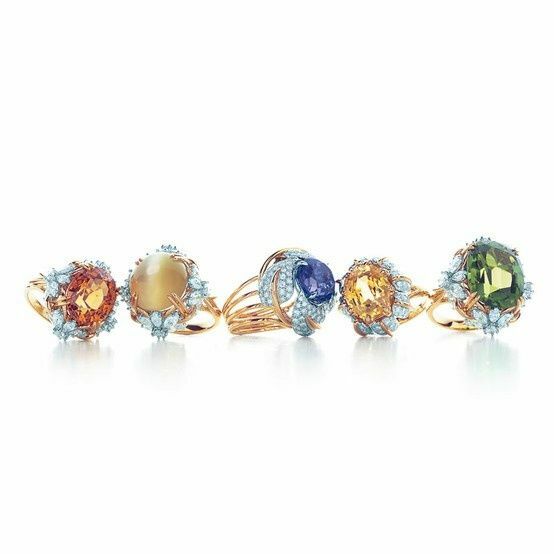 Tiffany & Co. Schlumberger® rings with diamonds, 18k gold and platinum, from left: spessartite; cat’s eye chrysoberyl; tanzanite; yellow sapphire and peridot. Gorgeous collection, just adore the diamond necklaces!